As the host in a meeting, you can manage the participants. By default, any participant in a meeting can share their video, screen, and audio. If you want to limit who can share their screen, video, and audio, we recommend using the webinar platform. For a full comparison of these options, see Meeting and Webinar Comparison. Read about all host controls. Some options have additional prerequisites and must be enabled on the web portal or require a specific version of Zoom for full functionality. 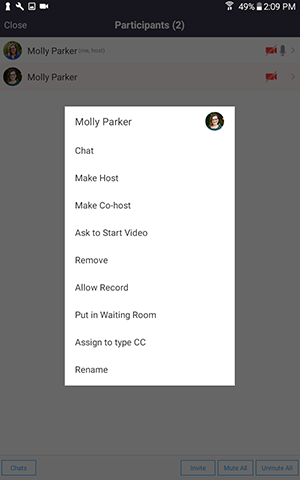 These features include giving a participant the ability to record locally, assigning a co-host, putting a participant on-hold and using the waiting room. *Limited controls are available when joining by web. Stop Video: Stop the participant's video stream so they are unable to start their video. If the participant hasn't started their video, you will see the Ask to Start Video option. Make Host: Assign the attendee to be the host. There can only be one host. Make Co-Host: Assign the attendee to be a co-host. You can have an unlimited number of co-hosts. Learn more. Allow Record: Allow the attendee to start or stop a local recording of the meeting. Attendees do not have access to start a cloud recording. Assign to type Closed Caption: Assign the attendee to type Closed Caption during the meeting. Rename: Change the attendee name that is displayed to other participants. Note: To change your own name that is displayed, hover over your name in the participants list and click Rename. This change only applies to the meeting. To permanently change your name, see My Profile. Put in Waiting Room: Place the attendee in a virtual waiting room while you prepare for the meeting. 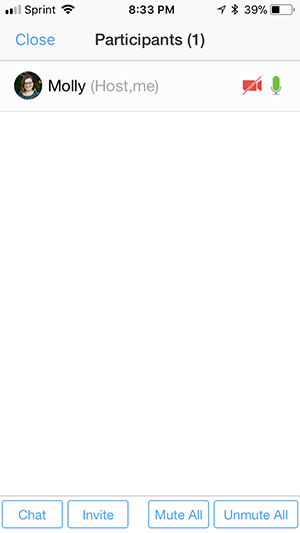 The host must enable waiting room for this option to appear. Learn more. Put On Hold: If the waiting room is not enabled, you'll see this option to place the attendee on hold. Remove: Dismiss a participant from the meeting. They won't be able to rejoin unless you allow participants and panelists to rejoin. Mute All / Unmute All: Mute or unmute all participants in meeting. Mute participants on entry: Automatically mute participants as they join the meeting. Allow participants to unmute themselves: Participants can unmute themselves if they want to speak to others in the meeting. Allow participants to rename themselves: Participants can change their screen name displayed to other participants. Lock meeting: Don't allow other participants to join the meeting in progress. Merge to meeting window: Merge the participants list with the main meeting window. This option is only available if you separated the participants list from the main meeting window. 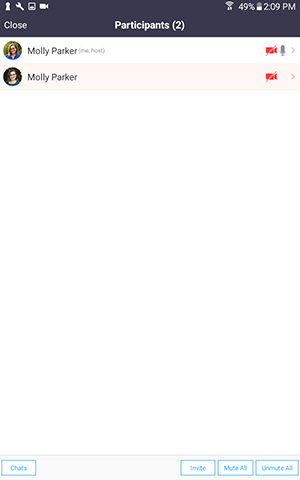 In the host controls, click the arrow next to Share Screen and click Advanced Sharing Options. Under Who can share? choose Only Host. Click Manage Participants in the host controls to display the participants list. Make Co-Host: Assign the attendee to be a co-host. There isn't a limit on the number of co-hosts. Learn more. Put On Hold: Place the participant on hold, removing them from the video and audio conference. The Allow host to put attendee on hold option must be enabled prior to starting the meeting. See Attendee on Hold for details. When joining via web, you will have limited functionality in managing participants. In the host controls, click Manage to display the participants list. Spotlight Video: Place the attendee as the active speaker for all attendees. Learn more. Tap Participants in the host controls to display the participants list. Tap a participant's name to manage a specific participant. Mute Audio: Mute the attendee's audio. Note: To change your own name that is displayed, tap your name in the participants list and tap Rename. This change only applies to the meeting. To permanently change your name, see My Profile. You can chat with the participants, invite others, mute or unmute all with the options at the bottom of the window. 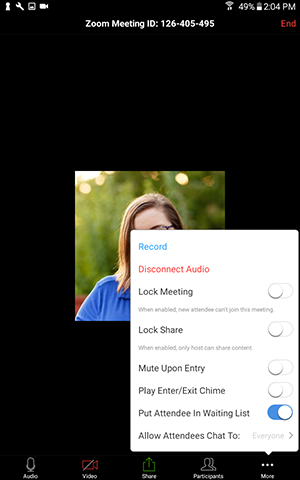 To lock the meeting or the screen share, mute participants upon entry, play the enter/exit chime, or put attendees into the waiting room upon entry, tap More then Advanced settings in the host controls. Lock Share: Prevent attendees from screen sharing. 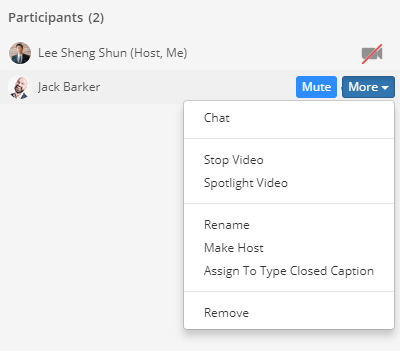 Mute on Entry: Automatically mute participants as they join the meeting. Put Attendee in Waiting Room on Entry: Place attendees in a virtual waiting room while you prepare for the meeting. The host must enable waiting room for this option to appear. Learn more. 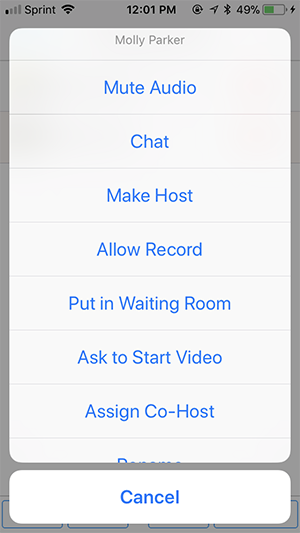 Allow Attendees to Chat with: Control whether attendees can with other attendees or only the host. Remove: Dismiss a participant from the meeting. Put in Waiting Room: Place attendees in a virtual waiting room while you prepare for the meeting. The host must enable waiting room for this option to appear. Learn more. Assign to type CC: Assign the attendee to type Closed Caption during the meeting. Mute Upon Entry: Automatically mute participants as they join the meeting. Put Attendee In Waiting List: Place the attendee in a virtual waiting room while you prepare for the meeting. The host must enable waiting room for this option to appear. Learn more. Allow Attendees Chat To: Control whether attendees can with other attendees or only the host.